What a rollercoaster of football we’ve witnessed over the past week for Crawley Town football club. It started with an undeserved 1-0 defeat at Port Vale, and ended with two really positive Home games that produced no fewer than nine goals and four very much welcome points. The referee was centre stage in both games, firstly dismissing three players in the epic midweek 2-2 draw with Swindon, including our very own Josh Payne, where we came from 2-0 down at halftime to secure a point with the last kick of the game. Then at home to Bury on Saturday some very peculiar decisions went against the Reds, but Harry’s men this time managed to turn a 2-1 deficit into a 3-2 victory after having three goals ruled out by the officials. A special mention has to go to super sub Panutche Camara and the new joint League Two top scorer Ollie Palmer for scoring the goals that secured a first home win of the season. But for me the main reason in our turn around in fortunes over the past week is the return from injury of captain Jimmy Smith who has provided that midfield steel and security that had been missing in the opening few games. Jimmy also opened the scoring against Bury and is very capable of chipping in with important goals as we’ve seen in the past. Welcome back Jimmy! Away from the on pitch action, the biggest own goal so far this season has been the club's new print at home ticketing service which is still causing fans confusion and is yet to go live. The queues for tickets for the first couple of home games were just wrong. Thankfully the club made amends at the Bury game by reopening some cash turnstiles. The problem appears to not be the new system itself but more the WiFi provider the club use. Something which is in the process of being changed to allow the new system to run more smoothly. I’m sure they will get it right in time, but as regulars know it just wouldn’t be Crawley without a few tinpot hitches along the way. 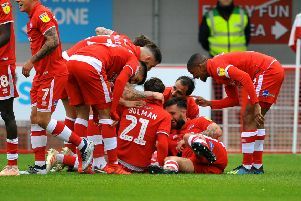 So onwards and upwards and all us Reds fans can now travel up to Manchester with a spring in our step this weekend, when we take on Frankie Bunn’s Oldham Athletic who sit like Crawley just outside the playoffs one point ahead of us. Safe journey Reds fans, In Harry we trust!